Anyone who has talked to me personally is aware of the effects that the Palm Oil industry has on the dwindling populations of wild orangutans. I've stopped buying any products with palm oil listed as an ingredient. At times, it seems like a pretty hopeless battle. 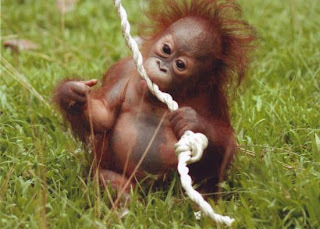 If something doesn't change soon orangutans will be extinct in the wild in as soon as five years. It is not just orangutans, the palm oil industry is taking the home of many other endangered species including gibbons, sun bears, pygmy elephants, langurs, lorises, clouded leopards, Sumatran tigers and the list goes on and on. Above that the destruction of forests is a huge contributor to global warming. The Rainforest Action Network has started a brilliant "the Problem with Palm Oil" campaign. 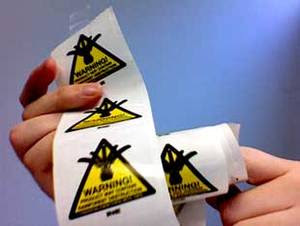 They give out stickers that say "This product contains rainforest destruction" and consumers go into stores and post them on all products containing palm oil. It is important to remember that "organic" or "green" doesn't always mean good for the environment. You'd be shocked at how many companies that market themselves as eco-friendly use palm oil in there products. The list of companies that use palm oil can be seen here. STOP BUYING PRODUCTS THAT CONTAIN PALM OIL. And let these companies know that consumers do not want to support this unethical destruction of our natural resources by signing a petition here. If you want to help support orangutans who have been orphaned by the palm oil industry, like baby Sen (above), you can adopt an orangutan here.